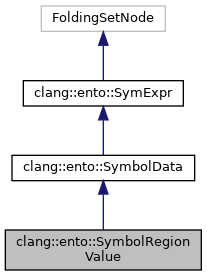 A symbol representing the value stored at a MemRegion. Definition at line 41 of file SymbolManager.h. Definition at line 45 of file SymbolManager.h. Definition at line 68 of file SymbolManager.h. Definition at line 110 of file SymbolManager.cpp. 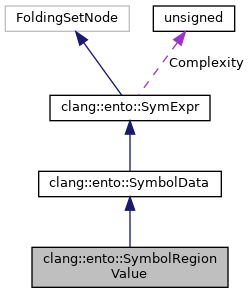 Referenced by clang::ento::SymbolCast::getOperand(), clang::ento::SymbolDerived::getRegion(), clang::ento::SymbolExtent::getRegion(), clang::ento::SymSymExpr::getRHS(), clang::ento::SymbolConjured::getTag(), clang::ento::SymbolMetadata::getTag(), clang::ento::IntSymExpr::IntSymExpr(), Profile(), and clang::ento::SymIntExpr::SymIntExpr(). Definition at line 63 of file SymbolManager.h. Definition at line 51 of file SymbolManager.h. Referenced by getOriginRegion(), clang::ento::SymbolDerived::getOriginRegion(), and clang::ento::SValExplainer::VisitSymbolRegionValue(). Definition at line 340 of file SymbolManager.cpp. Referenced by getOriginRegion(), clang::ento::SymbolDerived::getRegion(), clang::ento::SymbolExtent::getRegion(), clang::ento::SymbolConjured::getTag(), clang::ento::SymbolMetadata::getTag(), clang::ento::SymIntExpr::Profile(), clang::ento::IntSymExpr::Profile(), and clang::ento::SymSymExpr::Profile(). Definition at line 53 of file SymbolManager.h. Referenced by Profile(), clang::ento::SymbolConjured::Profile(), clang::ento::SymbolDerived::Profile(), clang::ento::SymbolExtent::Profile(), clang::ento::SymbolMetadata::Profile(), clang::ento::SymbolCast::Profile(), clang::ento::SymIntExpr::Profile(), clang::ento::IntSymExpr::Profile(), and clang::ento::SymSymExpr::Profile(). Definition at line 58 of file SymbolManager.h.